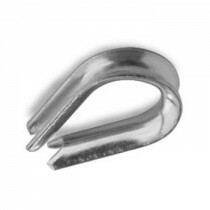 The addition of wire rope thimble to the wire rope eye, safeguards the rope and prolongs the working life of the wire rope. So, it is of utmost importance that it is incredibly strong and dependable. That is exactly what we offer here in Keble’s Trading. We have a selection of sizes from 2mm to 25mm that are made of trustworthy-quality Grade 316 stainless steel material making them resistant to high moisture or corrosive environments. We source stainless steel thimbles from global leading manufacturers to assure you get consistently good quality products you expect. Turn to Keble’s Trading for reliable-grade stainless steel THIMBLES. Talk to us! We speak your language! We understand your business. Call us at 1-800-067-687 or fill out the contact us form below. No inquiry is too large or too small. We would love to be of service to you today!